Opulence and Luxury in West Long Branch: Shadow Lawn ~ The History Girl! Newport, Rhode Island has many large and luxurious mansions, but in West Long Branch, New Jersey, there is not one, but two mansions standing from the early twentieth century on Monmouth University's campus. For the purpose of this article, only Shadow Lawn, now Woodrow Wilson Hall, will be featured. This grand mansion was built in 1929 by Hubert Templeton Parson, president of the F.W. Woolworth Company and stands on the footprint of an earlier wood-frame mansion, which was destroyed by fire in 1927. The former mansion, also named Shadow Lawn, was built in 1903 by John A. McCall, president of the New York Life Insurance Company. The mansion contained fifty-two rooms. It was purchased by Joseph B. Greenhut, the head of Siegel, Cooper Company, a New York department store. Greenhut loaned his mansion to President Woodrow Wilson during the campaign of 1916 as the presidential summer home. Thereafter, it was known as the Summer White House. On June 11, 1918, Hubert Templeton Parson and his wife Maysie acquired the property for $800,000. 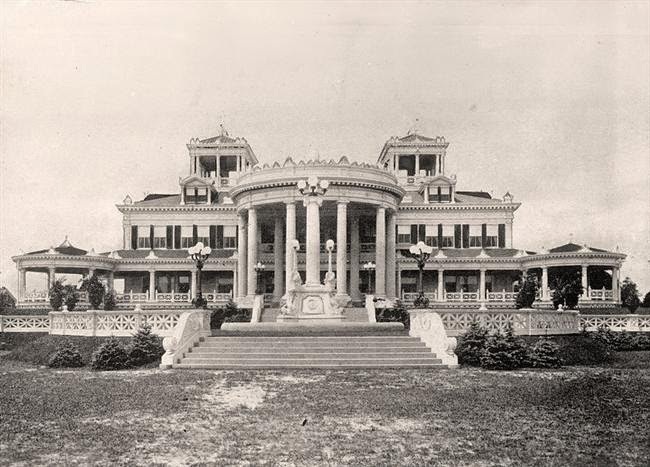 In 1927, the mansion was destroyed by fire, not long after it been refurbished at the cost of approximately $1 million. The name Shadow Lawn was derived from the long shadows cast by the many tall trees throughout the estate's property. 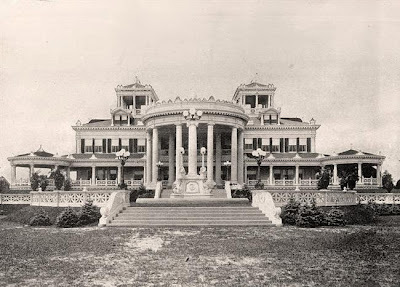 The original Shadow Lawn Mansion before the 1927 fire. The present mansion, built in the American Beaux-Arts style, was completed in September 1929 at a price of $10.5 million and consists of 130 rooms, including seventeen master suites and nineteen baths. It was designed by Philadelphia architect Horace Trumbauer and his assistant Julian Abele, who later became the first African-American professional architect. The men also designed the Church of Saint Catherine in Spring Lake, New Jersey, Gray Towers on the campus of what is now Arcadia University, the Widener Library at Harvard, and many buildings at Duke University. Their design, 300 feet long by 150 feet wide, boasted fifty varieties of Italian marble and limestone quarried in Belford, Indiana. By constructing it of concrete and steel framing, it ensured that the structure would be fireproof. A servants' wing was placed on the north-west corner of the home to house what amounted to twenty-five servants at any one time. Parson suffered heavy losses from the Stock Market crash of 1929. By 1938, the Parsons left Shadow Lawn because of back-taxes and missed mortgage payments. The estate was auctioned and sold to the borough of West Long Branch for $100. The building later served as a private girls' school until Monmouth University purchased the property in 1955. The mansion was placed on the National Register of Historic Places in 1978 and was designated a National Historic Landmark in 1985. Today, the building, fully restored, is used by the University as administrative offices and classroom space. The mansion's interior and grounds also served as the set of Daddy Warbuck's Park Avenue home in the 1982 movie Annie. The Great Hall is over 100 feet long and features a large skylight. The hall is three stories tall and is surrounded by hallways on the second and third floors. It is also the location of a central staircase which will bring visitors to a mezzanine level and the second floor. From the ground-level of the Great Hall, the Parsons could access their library, dining room, conservatory/breakfast room, billiard room, a sunroom, and Morning Room. The Versailles Room (formal dining room). The Versailles Room was the Parsons' formal dining room. It was designed in the late seventeenth-century design with a hexagonal, Byzantine-style coffered ceiling. The floor is parquet and the walls are a made of a dark wood paneling. Beyond the Versailles Room is the much brighter Pompeii Room, which served as a conservatory and breakfast room. The two rooms are divided by three sets of wrought iron doors. The doors are an outstanding example of Swedish wrought ironwork. The room also contains a beautiful fountain and overlooks the gardens. As part of the Parsons' morning ritual, the pipe organ would fill the home with music. The four-manual Aeolian-Skinner organ was usually played through the automatic concertola and could be controlled by switches throughout the mansion. The second level of the home contained bedroom suites, including the the Parsons' respective master bathroom suites. Each suite, as with the rest of the mansion, has its own unique decoration and feel. Mrs. Parson's suite is light in color and features floral designs. In contrast, Mr. Parson's suite is dark and masculine. His bathroom suite even features a modern-day shower complete with multiple shower heads. From the bedrooms, there was a set of light switches which could turn on all the lights in the mansion in case there was an intruder. Throughout the home, numerous switches and call-buttons with brass plates still exist. Mrs. Parson's bathroom suite and boudoir. Shower stalls/changing room in the former lower level pool area. The lower level (basement) of the home features an auditorium that was equipped with two movie projectors and a stage for live theater, a two-lane bowling alley (which was never used and has now been divided into different rooms), a swimming pool designed in the Pompeiian motif with marble shower and dressing stalls (now offices), a gymnasium, and locker room. The gardens at Shadow Lawn were designed by French landscape architect Achille Duchene. A péristyle, or covered colonnade, encloses one side, while a "water organ" fountain modeled after one found at Versailles, borders the far end of the gardens. During the Parsons residency, forty men maintained the grounds of Shadow Lawn. In addition to the the mansion, there was a twenty-two room guest lodge, a home for the superintendent, a two-story garage, barns, eight greenhouses, a poultry house, icehouse, and cottages for the dairy, greenhouse, and poultry supervisors. The péristyle, or covered colonnade.